Today marks one year since my mom’s death. One Year is a milestone. It means we have survived the “firsts”—the familiar holidays, birthdays, anniversaries, reunions, now all different due to the gaping hole left by my mom. We are still trying to figure out how to function as a family without her. She was the glue. She did a lot. One Year also makes me realize that all this time, I’ve been subconsciously hoping that this was still just a nightmare. I want to say, “Ok this can be done now. We’ve had enough sorrow and pain.” I’m like a child being dragged somewhere, digging my fingernails into the living room rug, refusing to go along. I don’t want to keep going down this sorrow-filled journey. I don’t want to keep yearning to see and hear my mom. I want to just see and hear her. But One Year reminds me, this is permanent until heaven. Man, that hurts. They say the First Year is the hardest, and I expected to crumble into a puddle of emotions and crying at every special occasion that was now being celebrated without my mom. But I didn’t. Those occasions were times to recall the happy memories, see the vast impact my mom made on our lives collectively, and relish family time, which my mom loved to the core of her being. Instead, the hardest parts of the First Year were the things I didn’t even think would be hard. It was not having my mom call me after my first day at my new job. It was not being able to ask her for advice when the girls got sick or were driving me crazy. It was not being able to spend the week with her while Travis was hunting in Wyoming. It was not having her to go shopping with, or ask about decorating opinions, or just listen to me while I vented about life. It wasn’t until my mom was gone that I realized how much I valued her as a friend. She was an excellent listener, and she had the ability to draw me out like no one else, save my husband. I told her things I told no one else but Travis, and she always listened with support and love. We had entire phone conversations that were just me talking about my problems, and her listening. It wasn’t until we hung up that I realized I had no idea what was going on with her, because we talked about me the whole time. That was my mom. She loved life. She loved people. Emma is one year old! 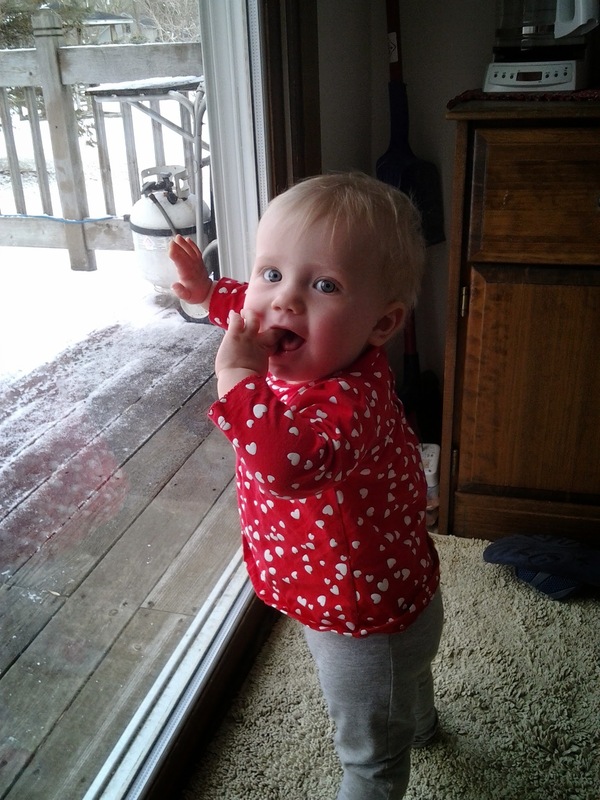 We had Emma’s 12-month checkup today at her new doctor in Brainerd. The nurse and doctor were both very nice. I think we will like going there. 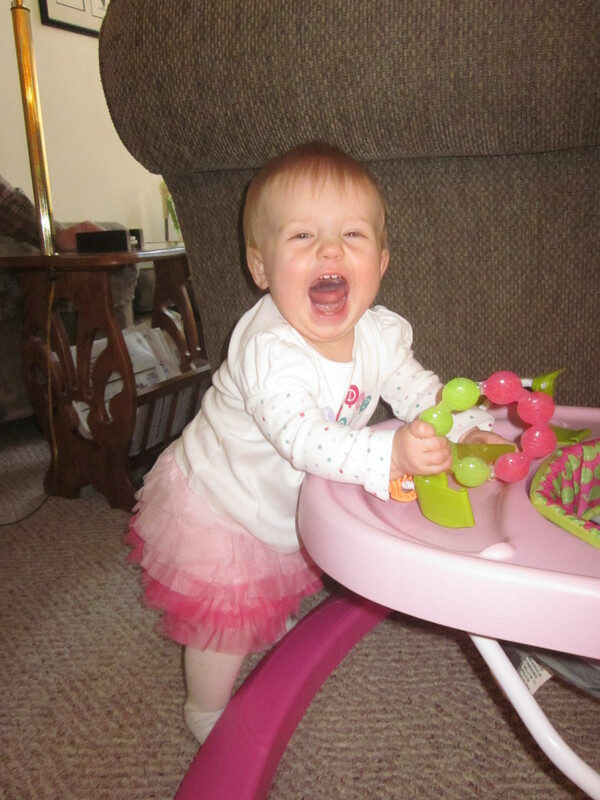 Emma now weighs 21 lbs 2 oz (71%) and is 29 inches long (37%), with a head circumference of 18.39 inches (91%). 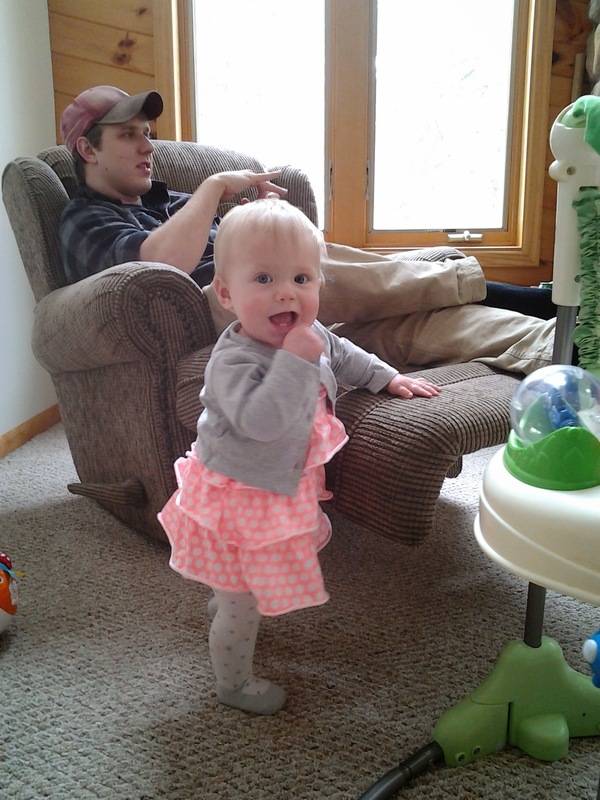 At 9 months, she was 74th percentile for weight and 66th for height, so she’s tracking along pretty good. 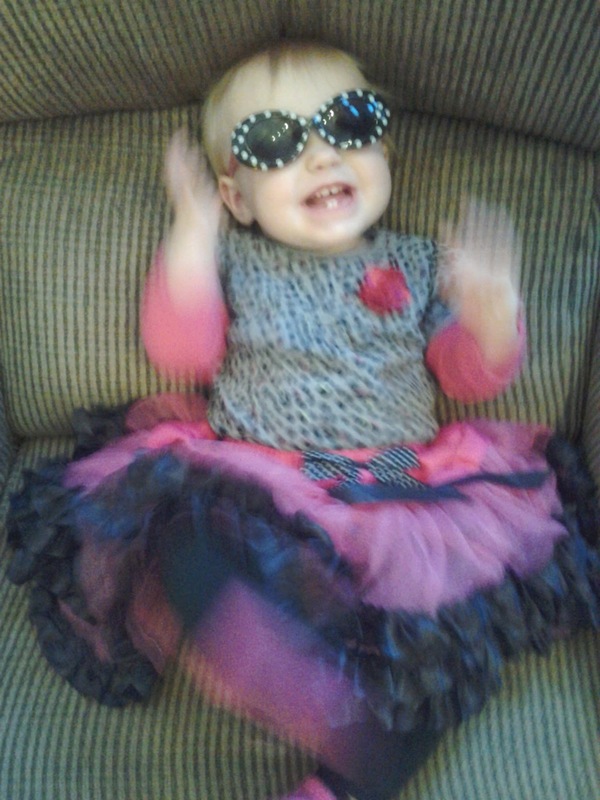 She’s still wearing size 4 diapers, and is wearing all 12-month clothes, and starting to wear 18-month sizes. Emma is still a really good eater – if we give her the foods she likes. 😉 She has gotten somewhat pickier about what she will eat than she was when we first started solids. Or should I say, she’s not a huge fan of most ‘table foods’ as the doctor calls them. She still prefers to eat purees and spoon-food like yogurt, oatmeal and soup most days. She does really enjoy feeding herself cut-up fruit, puffs and cheese, and also likes deli meat and tofu. But she will not touch a vegetable to save her life. She will eat them in purees, but not as finger foods. So we usually just resort to purees. We always know when Emma either doesn’t like a food or is finished with it, because she’ll pick up a piece and throw it off her tray to the dogs. They are loving this development. Even though it’s not something we want to encourage, it’s just so darn funny to watch. We switched from formula to whole milk this past week and it went well. She didn’t care at all. She also weaned herself from nursing at the end of March. Because of my low supply, I had slowly worked down to only nursing her in the morning. But then one morning, she wanted nothing to do with it. Just like that, we were done. Surprisingly, I was actually more sad about her not drinking formula anymore, than I was about not nursing anymore. Probably because it was such a gradual transition. And her drinking whole milk means she’s no longer a baby! Emma still has only 6 teeth. Whenever she has a rough night or seems to be in pain, I think she might be teething, but nothing so far. I was dreading our move to Minnesota, because when we were here at Christmas, Emma slept awful. But she totally surprised me and has slept better here than she was sleeping in Colorado! She now sleeps straight through the night without waking up, or if she does wake up, she can get herself back to sleep after 5-10 minutes. It is so nice to not have to get up anymore! Most nights, she goes to bed around 6:30, though if she takes a longer/later nap, she goes to bed as late as 8:00. I definitely prefer the earlier bedtime, because she still gets up at the same time in the morning – usually 6 am. The past couple of mornings, I’ve heard her crying/squawking at 4:15 am, which is waaaayyy too early, but she fell back asleep eventually thank goodness. Naps are still hit or miss. I’ve been trying to put her down according to the clock and not her sleepy signs, because around me, she doesn’t really make them. The only thing she does is rub her eyes, and sometimes it seems like I’ve already missed ‘the window’. Most days, she takes 2 naps that are 45 minutes to an hour long. Sometimes, I get lucky and she sleeps for longer. On the days I’m really desperate, I’ll take her for a drive around her naptime, then carry her into her room in her carseat and she’ll usually sleep for about 2 hours. But that game plan won’t work anymore once we buy her a new carseat (which we haven’t done yet, and aren’t really in a hurry to do). Emma isn’t rocked to sleep for any naps or bedtime anymore, for the sheer reason that she won’t allow it. She cries, pushes away or won’t settle down if we try. So it’s into the crib for crying-it-out. Sorry babe, but you gotta sleep. Emma has gotten really good at crawling and pulling up on things. She loves to open drawers and empty the contents. 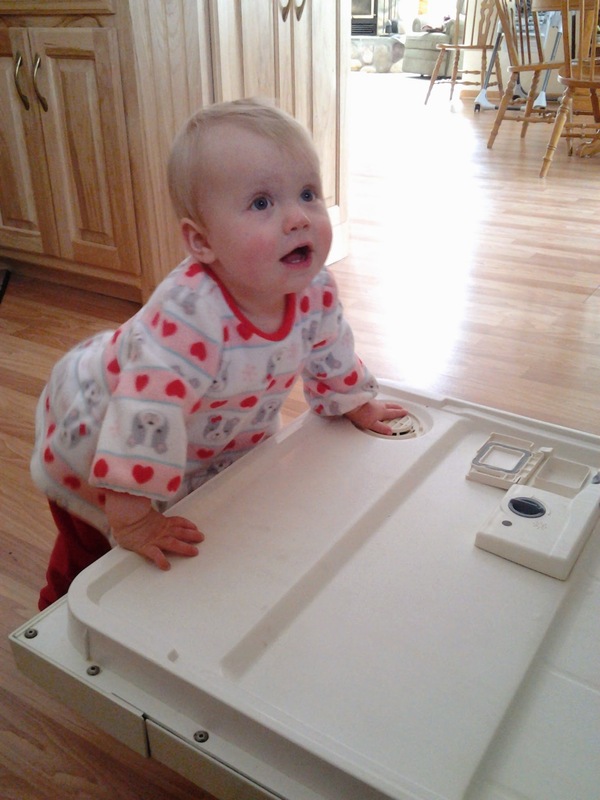 She loves helping to unload the dishwasher (even when you’re loading it!). She can push toys and her walker around while walking behind them. She’s not walking yet, but she has stood on her own without aid several times, so she’s making progress toward that end! She still carries toys around in her mouth like a puppy dog, and chews on everything. I don’t let her play with books very often, because she will destroy them with saliva. She won’t sit still for books ever, so I read them to her while she plays with other toys – if she’ll let me. Sometimes if she sees me with a book, she’ll grab it. Then if I try reading a different one, she’ll grab that one too. We were reading the Little House on the Prairie series during baths (for that reason), but have gotten out of the habit with the move. 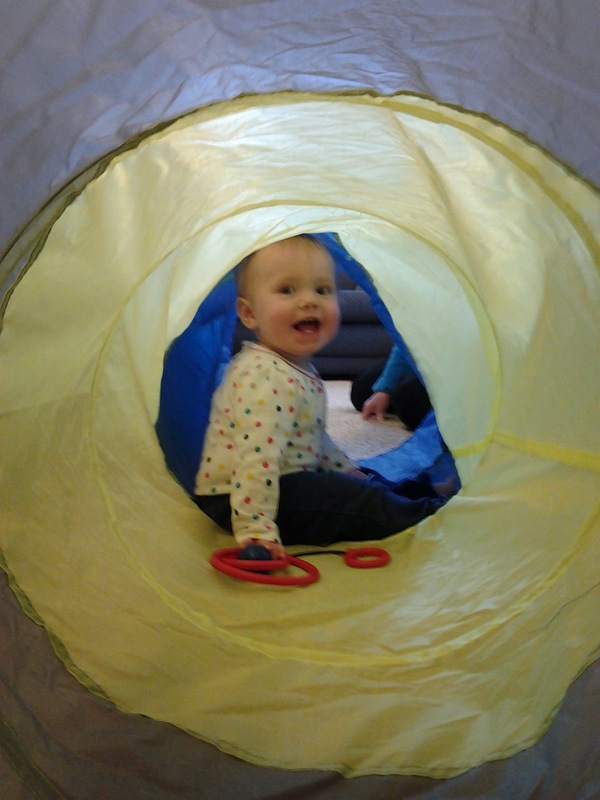 I mentioned in my letter to Emma that she has learned how to play peekaboo, wave, clap and give five – for the most part. Sometimes, we try to get her to do it and she looks at us like we’re crazy. She has also started to lift one hand in the air, like she’s declaring something – or if she has a toy in it, like she’s offering it to you. Emma doesn’t like her jumperoo or walker much anymore – she likes her Johnny Jumpup sometimes, but she mostly just wants to be mobile and finding stuff to make a mess with. We call her Destructobaby. I find myself looking for things that Emma can empty/clear out. We discovered the spice cabinet here at Grandma and Grandpa’s, and that keeps her busy for a good 30 minutes. The Tupperware cabinet is also a favorite, but she often gets sick of that faster. And then it’s on the next mess while Mommy picks up after her! I thought I would be frustrated at that part of parenthood, but she enjoys it so much (and I’m so happy to find something that occupies her) that I really don’t mind. Forget about organization for the foreseeable future though. Emma LOVES our dogs and often squeals in delight when she sees them, or gets close enough to touch them (which is rare, because they have started to avoid her!). Emma is still a very vocal, loud girl. She doesn’t say any words yet really – though I think she might say ‘dada’ in reference to Travis – but she babbles a LOT. She also giggles, laughs and shrieks. Who knew a little baby could be so loud? Well, I think I’ve covered almost everything! I’ll be back tomorrow with her birthday party post.